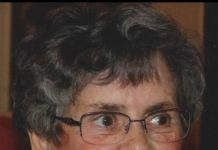 Hudson – Kathleen V. (Madden) Stewart, 79, a longtime resident of Hudson, died Tuesday, Oct. 18, 2011 at Marlborough Hospital. She was the wife of the late Dr. James M. Stewart, who died in 1992. Born and raised in Marlborough, daughter of the late Daniel F. and Mary (McAuliffe) Madden, she was a graduate of Saint Michael&apos;s Academy in Hudson and later was a graduate of the Saint Vincent&apos;s Nursing School in Worcester. She was a member of Saint Michael&apos;s Parish in Hudson for many years and was a member of the church&apos;s Ladies Sodality. She is survived by her children, James Stewart Jr. and wife Kathryn of Spencer, Shaun Stewart and wife Paula of North Brookfield, and Mary Theresa Marechaux and husband Curt of Mt. Holly, Vermont. She is also survived by her two sisters, Regina Costello of New Jersey and Alice Donnelly of Pennsylvania; six grandchildren, Jessica, Matthew and Kyle Alberte, Emily and Megan Stewart, Nickolay Stewart; her great-grandson, Nolan Alberte; and many nieces and nephews. She was the sister of the late Rose Crowley, Irene Manning, Marie Gelanis and Daniel Madden. A funeral Mass will be celebrated Saturday, Oct. 22, at 9 a.m., in Saint Michael&apos;s Church, 21 Manning St., Hudson. Burial will follow in Saint Michael&apos;s Cemetery of Hudson. Calling hours will be held Friday, Oct. 21, from 5 to 7 p.m., at the Tighe-Hamilton Funeral Home, Inc., 50 Central Street, Hudson.